Massimo Campigli (born Max Ihlenfeldt, 4 July 1895 – 31 May 1971) was an Italian painter and journalist. He was born in Berlin, but spent most of his childhood in Florence. His family moved to Milan in 1909, and here he worked on the Letteratura magazine, frequenting avant-garde circles and making the acquaintance of Boccioni and Carrà. In 1914 the Futurist magazine Lacerba published his “Giornale + Strada – Parole in libertà” (“Journal + Road – Free speech”). During World War I Campigli was captured and deported to Hungary where he remained a prisoner of war from 1916–18. At the end of the war he moved to Paris where he worked as foreign correspondent for the Milanese daily newspaper Corriere della Sera. Although he had already produced some drawings during the war, it was only after he arrived in Paris that he started to paint. At the Café du Dôme he consorted with artists including Giorgio de Chirico, Alberto Savinio, Gino Severini and Filippo De Pisis. Extended visits to the Louvre deepened Campigli’s interest in ancient Egyptian art, which became a lasting source of his own painting. His first figurative works applied geometrical designs to the human figure, reflecting the influence of Pablo Picasso and Fernand Léger as well as the Purism of “L’Esprit Nouveau”. In 1923, he organised his first personal exhibition at the Bragaglia Gallery in Rome. During the next five years his figures developed a monumental quality, often with stylised poses and the limbs interwoven into a sculptural solidity. The importance given to order and tradition, the atmosphere of serenity and eternity were in line with the post-war reconstruction and the programme of the “Twentieth Century” artists with whom Campigli frequently exhibited both in Milan from 1926–29 and abroad from 1927–31. As from 1926, he joined the “Paris Italians” together with de Chirico, de Pisis, Renato Paresce, Savinio, Severini and Mario Tozzi. In 1928, year of his debut at the Venice Biennial, he was very much taken by the Etruscan collection when visiting the National Etruscan Museum in Rome. He then broke away from the compact severity of his previous works in favour of a plane with subdued tones and schematic forms rich in archaisms. During a journey in Romania with his first wife Magdalena Rădulescu, he started a new cycle of works portraying women employed in domestic tasks and agricultural labour. These figures were arranged in asymmetrical and hieratic compositions, hovering on a rough textured plane, inspired by ancient fresco. These works were enthusiastically received by the critics at the exhibition held in the Jeanne Bucher gallery, Paris, in 1929 and at the Milione Gallery, Milan, in 1931. During the ‘thirties he held a series of solo exhibitions in New York, Paris and Milan which brought him international acclaim. In 1933 Campigli returned to Milan where he worked on projects of vast dimensions. In the same year he signed Mario Sironi’s Mural Art Manifesto and painted a fresco of mothers, country-women, working women, for the V Milan Triennial which unfortunately was later destroyed. In the following ten years other works were commissioned: I costruttori (“The builders”) for the Geneva League of Nations in 1937; Non uccidere (“Do not kill”) for the Milan Courts of Justice in 1938, an enormous 300 square metre fresco for the entrance hall, designed by Gio Ponti, of the Liviano, Padua which he painted during 1939–40. 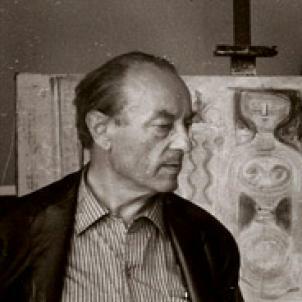 After divorcing in 1939, Campigli remarried with the sculptor Giuditta Scalini. Together they passed the war years in Milan and in Venice, then after the war they divided their time between Rome, Paris and Saint-Tropez. In 1943, his son Nicola was born in Venice. In a personal exhibition at the Venice Biennial in 1948 he displayed his new compositions: female figures inserted in complicated architectonic structures. During the 60s his figures were reduced to coloured markings in a group of almost abstract canvasses. In 1967 a retrospective exhibition was dedicated to Campigli at the Palazzo Reale in Milan. He died of a heart attack in 1971 in Saint-Tropez. Italian artist Giorgio de Chirico is best known for his enigmatic paintings of the 1910s and ’20s, and for his influence on the Surrealist movement. 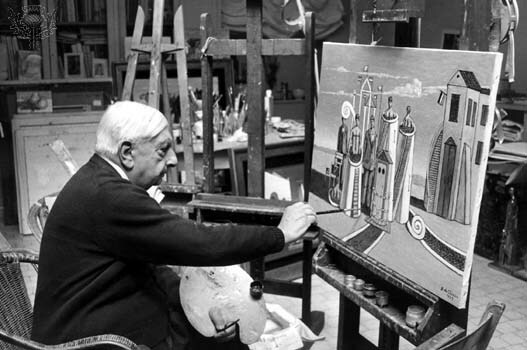 Giorgio de Chirico was born to Italian parents in Volos, Greece, on July 10, 1888. In his art, he sought to evoke the hidden meanings behind everyday life, and his enigmatic scenes of empty cities, menacing statues, mysterious shadows and strange combinations of everyday objects inspired the artists of the Surrealist movement in the 1910s. His important “metaphysical” works from these years include “The Enigma of an Autumn Afternoon,” “The Soothsayer’s Recompense” and “The Mystery and Melancholy of a Street.” After a long career, de Chirico died in Rome, Italy, on November 19, 1978. 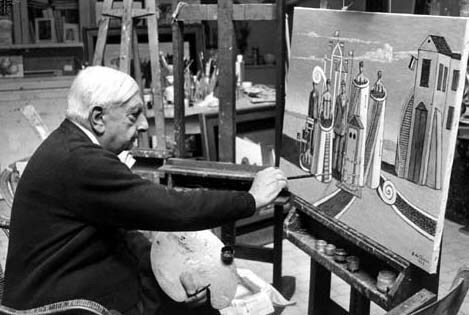 Giorgio de Chirico was born to Italian parents in the town of Volos, in the Thessaly region of Greece, on July 10, 1888. He first studied art at the Higher School of Fine Arts in Athens. After the death of his father in 1905, de Chirico’s mother moved her three children to Munich, where de Chirico completed two years of study at the Academy of Fine Arts. After leaving the Academy he continued to educate himself, taking a particular interest in the philosophical writings of Arthur Schopenhauer and Friedrich Nietzsche. He returned to Italy in 1908, traveling to Milan and Turin and settling in Florence. As a young artist, de Chirico was inspired by the European Symbolist artists and their use of dream-like imagery. His earliest signature works combined a Symbolist sensibility with his love of the classical antiquities of Greece and Italy and his philosophical musings on the true nature of reality. In paintings such as “Enigma of an Autumn Afternoon” (1910), de Chirico depicted dramatically lit city piazzas inhabited only by one or two figures, a statue or mysterious shadows. In 1911, de Chirico traveled to Paris, France, where his brother, Andrea (also known as Alberto Savinio), was living. There, he exhibited his work and met a number of influential avant-garde artists and writers, including Pablo Picasso and Constantin Brancusi. De Chirico produced many of his most important and influential paintings during his Parisian stay of 1911-15. In works like “The Soothsayer’s Recompense” (1913) and “The Mystery and Melancholy of a Street” (1914), he continued to paint scenes of classical architecture and town squares punctuated by only a lone figure or monument. The mood of these paintings, with their exaggerated perspectives and empty spaces, was increasingly unsettling. Meanwhile, World War I had begun, and de Chirico and his brother were drafted into the Italian Army in 1915. De Chirico was stationed in Ferrara, but soon afterward, he had a nervous breakdown and spent time in a military hospital. In 1917, he met artist Carlo Carrà, who worked with him to define his style of “metaphysical painting,” emphasizing the hidden significance of ordinary places and objects. De Chirico’s “metaphysical” works, including “Love Song” (1914), “The Seer” (1915) and “The Disquieting Muses” (1917), featured illogical combinations of everyday objects such as rubber gloves, fruit and maps, and were peopled by faceless mannequins. By this time, de Chirico’s work was greatly admired by the newly formed Surrealist school of artists and writers, who were fascinated by dream analysis and the subconscious mind. Though de Chirico did not identify himself as a Surrealist, he briefly collaborated with the artists of this circle, showing his work in their group exhibitions in Paris and illustrating books by Guillaume Apollinaire and Jean Cocteau. However, in the 1920s, he began working in a neo-traditional style inspired by Renaissance “old masters” like Raphael and Titian, and he turned against modern art and broke ties with the Surrealists. De Chirico’s later career was inconsistent and occasionally controversial. He worked in a variety of formats from theater design to book illustration to sculpture, but his style was subject to unpredictable changes. His reputation was damaged when falsely dated copies of his works, by both de Chirico himself and forgers, infiltrated the art market. De Chirico died on November 19, 1978, in Rome, Italy. He had been married twice, first to Raissa Gurievich and then to Isabella Pakszwer Far. After his death, de Chirico was recognized and praised for his influence on both the Surrealists and a later generation of artists, photographers and filmmakers.